Seit 2016 vergibt die DAGM einen Preis für die beste Masterarbeit, die als ordentlicher Beitrag zur GCPR eingereicht wurde. Die Kriterien der Einreichung finden sich unter www.dagm.de/ausschreibungen/young-researchers-forum/ . Der Preis ist mit 500 Euro dotiert. Der Master Award 2018 wird an Herrn Michael Strecke vergeben. Im Bild (von links nach rechts) Prof. Dr. Helmut Mayer (Sprecher des TK der DAGM e.V. ), Michael Strecke, Prof. Dr. Reinhard Koch (Präsident der DAGM e.V.). Michael Strecke has obtained both the BSc and the MSc from the University of Konstanz. During his Bachelor studies, he spent half a year in Canberra, Australia. Right now he is pursuing his PhD at the Max Plank Institute for Intelligent Systems in Tübingen. 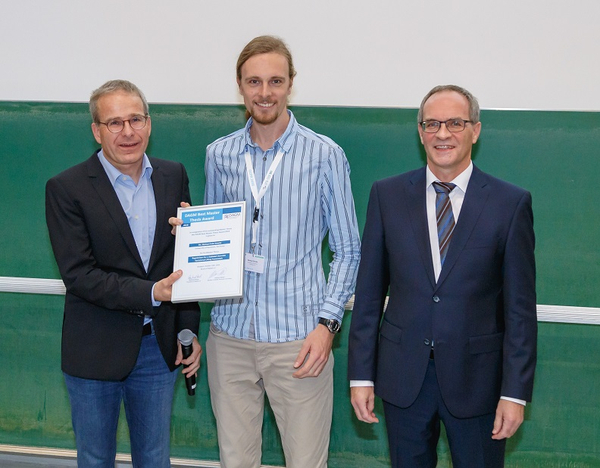 His Master Thesis “Regularizers for a Sublabel-accurate Variational Lifting Framework” supervised by Bastian Goldlücke led to the paper “Sublabel-accurate Convex Relaxation with Total Generalized Variation Regularization”. The latter presents “a novel regularization strategy for lifted second order Total Generalized Variation”. It is “compared with related work on the problems of denoising and light field disparity estimation”. The reviewers have noted that “good results are shown across different applications”, a “very good overview of related work with appropriate citations” is given and that it is a “very advanced topic for a young researchers forum contribution”. 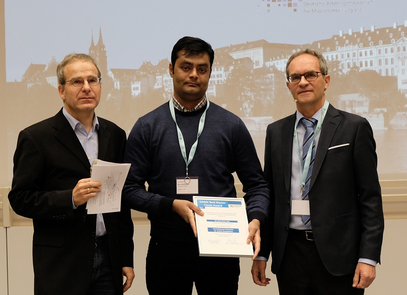 Der Master' Thesis Award 2017 wird an Herrn Mian Ahsan Iqbal für seinen Beitrag "Convolutional networks for Action Recognition" vergeben. Im Bild (von links nach rechts) Prof. Dr. Helmut Mayer (Sprecher des TK der DAGM e.V. ), Mian Ahsan Iqbal, Prof. Dr. Reinhard Koch (Präsident der DAGM e.V.). Mian Ahsan Iqbal obtained the BSc from the University of Punjab, Lahore (Pakistan) and the MSc at the University of Bonn, both in Computer Science. He is right now pursuing his PhD also at the University of Bonn. His Master Thesis about “Convolutional Networks for Action Recognition” led to the paper “Recurrent Residual Learning for Action Recognition”. It extends the image classification model ResNet by introducing recurrent connections that allow to learn a spatio-temporal residual. As only a limited range of preceding image frames can contribute, training and inference are efficient. Its superior performance is verified on a large-scale action recognition dataset. The reviewers have noted that the “network performs favorably (compared to) a number of investigated variants” and “The idea of a combination of residual and recurrent neural nets is quite new”, hence this Master Thesis has been awarded the Best Master's Thesis Award 2017. Der Master' Thesis Award 2016 wird an Frau Christine Kroll für ihre Masterarbeit "Segmentation of MRI and Ultrasound Scans using Deep Convolutional neural Networks" vergeben. Frau Kroll hat ihre Arbeit an der TU München unter der Betreuung von Prof. Nassir Navab abgefasst. Der DAGM Young Researchers' Prize wurde letztmalig in 2009 vergeben, indem eine Arbeit des Young Researchers' Forum prämiert wurde. Ab 2010 werden keine Preise im Young Researchers' Forum mehr vergeben. Stattdessen erhalten die zum Forum angenommenen Nachwuchswissenschaftler freien Eintritt zur DAGM Konferenz. Der DAGM-SMI Preis wurde in den Jahren 2006-2008 an junge Nachwuchswissenschaftler für exzellente Diplomarbeiten vergeben.